This is a short 3 days Lake Mburo National park safari. Lake Mburo National park is Uganda’s smallest National park but full of wonders. 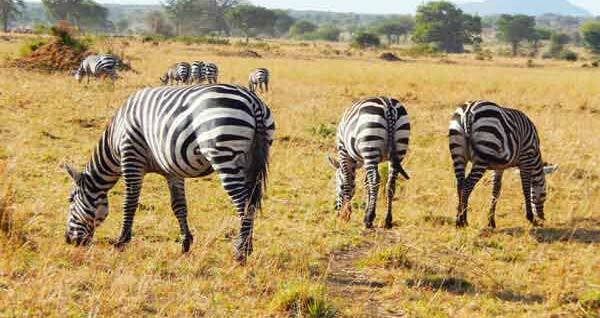 It is located southwest of Kampala and the easiest park to access in Uganda. Large numbers of Zebras, Impalas, Topis, Elands, Leopard, Hippopotamus, Buffalos, Giraffes, Water bucks and Bushbucks are habituated in Addition to Warthogs. After breakfast, meet and greet with your guide. Start a five hour drive through the suburbs of Kampala/Entebbe. A must stop at the equator with an experimental impression of the change in hemispheres. A good eye opener to African crafts and hand/wood works lined along the equator and coffee/tea shops. Arrival at your accommodation check in and lunch in the afternoon. In the evening we go out for a Game search, in likes of Zebras, Giraffes, Buffalos, Impalas, Waterbucks, and Leopard, to mention but a few. A morning game drives/nature walk, giving us an opportunity to get close to animals which seem to be more active in the morning, in the afternoon we go for a boat ride. Water life is charming, great concentration hippopotamus, crocodiles, African fish eagles, pied kingfishers, malachite kingfishers, African fin foot among others. In the evening we go for the sundowner at Kazuma outlook point, a great place to see the whole park. After breakfast, we bid farewell to our lodge, have a game drive and see what nature has to offer to us before we sign off for Kampala or Entebbe. Stop for lunch before arriving to our destination.